Whale-watch week, Dec. 27-31, is prime time to spot migrating leviathans while stretching your legs on a beautiful shore. DEPOE BAY, Ore. — One of the greatest privileges of living in the Pacific Northwest is the knowledge that whales, those largest and most magnificent of mammals, are often seen off our coast. 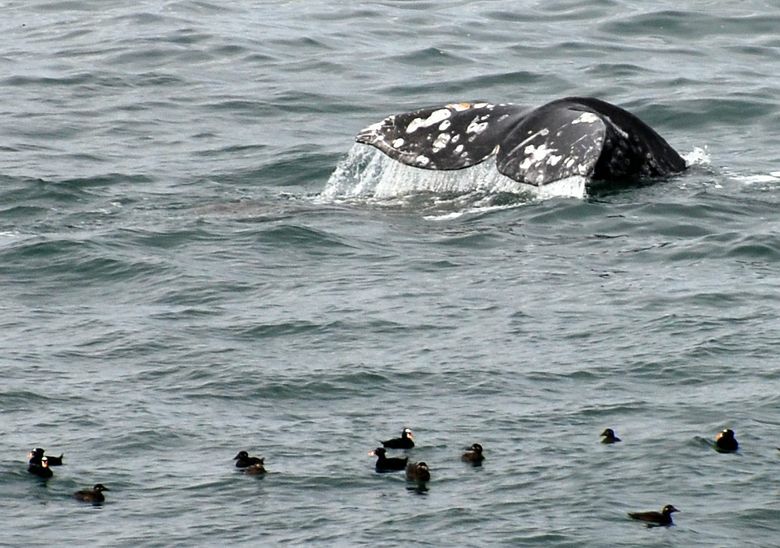 And while winter and spring can bring their share of headaches, those seasons also are some of the best times to spot gray whales as they migrate past our shores. Savvy whale watchers know how to maximize chances for seeing one: Find an outcropping above the water with unobstructed views. Conveniently, many of the best whale-watching spots are also great for hiking, which makes it easy to combine the two. At Cape Disappointment State Park, Washington state’s Discover Pass is required. The week after Christmas is always an official whale-watch week in Oregon (Dec. 27-31, 2015). The state parks’ “Whale Watching Spoken Here” program trains volunteers to answer questions and help folks spot whales at 22 sites along the Oregon coast, as well as at Washington’s Cape Disappointment State Park, in Ilwaco, and in Crescent City, Calif.
Another whale-watching week is the final week in March (March 19-26, 2016), when whales that have wintered in Mexico head north again to summer feeding grounds. But whales are swimming past the Northwest coast throughout December, January, March and April. The Oregon State Parks website includes count totals from previous years’ whale-watching weeks, which might help you decide when and where to go (though every year is a bit different). Whale watching requires patience. You’ll likely see the spout before you see any other sign of the whale. Be sure to bring a scope or binoculars, but first look with the naked eye, park ranger David Newton suggests. When you spot that telltale white puff, bring up the binoculars for a closer look and you might be lucky enough to see a shiny back rising from the water. Try to go on a clear day with gentle winds, since stronger breezes can swipe a whale’s blow before you can see it. “The coolest thing to see — and it doesn’t happen very often — is a breach,” when whales leap out of the water, said Newton, who’s helped run the whale watching programs for more than 10 years. Slightly more often you’ll see “spy hopping,” when whales peek their heads above the water. Here are some of the best locales to combine whale watching with coastal hikes. Volunteers will be staffing most of these sites, in both December and March, as part of the Whale Watching Spoken Here program. Cape Disappointment State Park (Washington): Oregon State Parks pairs with this park on the Columbia River’s north side, with volunteers stationed at the park’s Lewis and Clark Interpretive Center. The North Head Lighthouse, which overlooks the ocean rather than the river, is another ideal place to scan for whales, and the mostly paved 8-mile Discovery Trail takes you along the coast from the cape’s rocky promontory all the way to Long Beach. Oswald West State Park: Its protected cove is a favorite for surfers and beachcombers, but I’d rather climb Neahkahnie Mountain, the park’s highest point, which overlooks the beach and the ocean. The trail wanders through old-growth cedar, hemlock and spruce on its way to open views atop the crag. 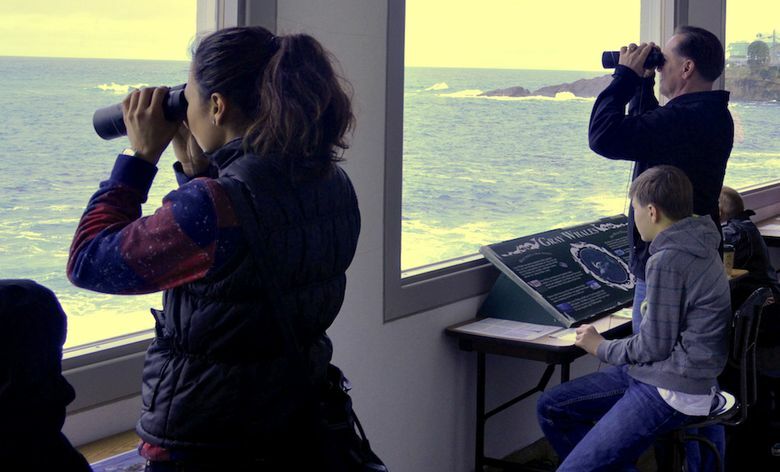 Look for whale-watch volunteers at a Highway 101 viewpoint on the shoulder of the mountain. Cape Lookout State Park: This is one of three state parks along the Three Capes scenic driving route, and locals know it as one of the state’s best whale-watching spots. Hike 2.5 miles on the Cape Trail to where volunteers are stationed at the end of the promontory with unobstructed water views in almost every direction. “It’s a bit of a trek to get out there, but it’s worth it,” Newton said. Depoe Bay: If you could start your whale hunt in any one place, it should be here. The Whale Watching Center in this weather-beaten seaside town serves as a handy clearinghouse for information, and whales often frolic in the sea near the waterfront walking path or in nearby Boiler Bay. Devils Punchbowl State Natural Area: This picnic oasis is a pleasure whether whales are out or not. A short trail outlines this promontory, and when water is high, waves crash into the park’s namesake formation just below. Short trails lead to long beaches. Cape Perpetua Scenic Area: Near Yachats, you can drive to the summit of the cape, which tops out at 800 feet. But the zigzagging St. Perpetua trail, 1.5 miles each way, is more fun and better exercise, and viewpoints along the way are great for scanning the Pacific. Look for whale-watch volunteers at the interpretive center and the Cook’s Chasm turnout from 101. Bullards Beach State Park: Wander along 4.5 miles of beach north of Bandon, Ore., or use your binoculars to spot birds at adjacent Bandon Marsh National Wildlife Refuge when you’re not looking for whales. Umpqua Lighthouse State Park: The lighthouse itself is a prime spot for whale watching, and it’s amid a larger recreation area full of tall dunes, each with its own ever-changing view. Camp here and make it a base for exploring the surrounding peaks and valleys. Humbug Mountain State Park: Hike the 4.5-mile Humbug Mountain Trail loop to the top of the park’s 1,756-foot promontory. For a lightly less strenuous hike to another local lookout point, walk the spine of Battle Rock Park in nearby Port Orford, which a local meteorological phenomenon makes one of the Northwest’s warmest towns in winter.